Take a vacation horseback riding in Yellowstone National Park with licensed Yellowstone outfitter Jett Hitt and his Yellowstone guides. Jett is a lifelong horseman and a seasoned Park guide. 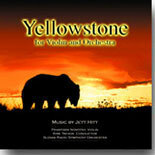 He is also the composer of Yellowstone for Violin and Orchestra. Let us help you plan the perfect vacation horseback riding in the Yellowstone backcountry. If you are interested in a custom horseback riding trip to some remote area that you have been longing to see, we will help you plan a day ride or a Yellowstone pack trip. If you don't know where you would like to go, let us recommend some of our favorite pack trips in the Park. We also do fly fishing pack trips, including trips to Slough Creek , the Snake and Lamar Rivers as well as the Thorofare. Whether you are interested in a day ride or a pack trip, we can help you put the perfect vacation together. 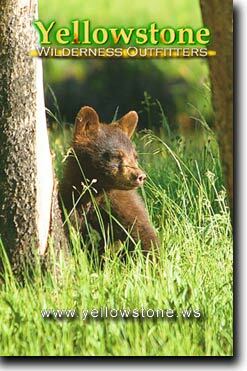 Everything from where to stay to where to see wolves and bears, we can help you do it. Look through our photo album and see some of the breathtaking scenery that awaits you on a pack trip with Jett and his guides in the backcountry. Be sure to take a sample pack trip and see what a perfect vacation a pack trip can make. Check out our maps page to compare the routes and prices of our trips. Email us for more information about any trip. Be sure and read our Why Choose Us page before booking a pack trip with anyone. Our half and full day rides are designed to show you some of the fascinating features of Yellowstone. It is not just about horseback riding; it is about seeing Yellowstone. We plan our rides in the most picturesque parts of the park. A full description of our day rides can be found at Yellowstone Horseback Riding. For great family fun, we also offer a combination package with river rafting and horseback riding. It is the only package of its kind in the Yellowstone Area, allowing you to horseback ride inside of Yellowstone National Park and raft the Yellowstone RIver See our Paddle and Saddle package. Our Yellowstone pack trips are designed to show you the Park. We don't just take you out in the woods for a bit of camping. On our pack trips, you will see important features that contributed to the founding of Yellowstone National Park. A full description of many trips that we offer, including maps, can be found at Horse Pack Trips - Maps and Prices. We have also added a new complement of 3D Animated Maps of our Yellowstone pack trips. Yellowstone National Park is located in Wyoming, Montana and Idaho. We operate out of Gardiner, Montana, the community at Yellowstone's northern gate. We offer horseback riding throughout the whole park. Our pack trips canvas the entire 1,200 miles of trails in the park, and most of our day rides take place in the northern portion. Check our Calendar for availability. A Yellowstone vacation takes special planning, and we have put together a set of tools to help you plan your Yellowstone vacation. Whether you are joining us on a pack trip, a day ride or whether you are just coming to Yellowstone, our Yellowstone Vacation page will help you make the most of your visit. It includes a Visitors Guide, a Camping Guide and everything that you will need to make your vacation complete. Be sure to check out the best selling CD by your outfitter and guide, Jett Hitt. It is the perfect sound track to your Yellowstone vacation.